Home / Children's / Books & Media / Boom Bah! Ting!” a kitchen mouse discovers that striking a teacup with a spoon makes the most marvelous sound. Soon, a bevy of farm animals are raiding the cupboards to create their own homemade instruments (“A box, a bowl/ A spoon, a stick./ Tap! Tap!/ Clickety-click!”), and the ensemble is off and strutting: “BOOM BAH! Here we go!” A bona fide band with spiffy uniforms and real instruments (but still staffed by animals) suddenly appears; the amateurs, far from being, um, cowed, join in the parade and seem to beckon readers to come along. There’s no real story—it’s basically a flash mob assembled by sound rather than cellphones—and first-time author Cummings’s simple, exclamatory rhymes are like blasts from a trumpet. The infectious joy of spontaneous music making comes through loud and clear, thanks to newcomer Rycroft’s effervescent watercolor and pencil drawings. Composing all her images along the same stagelike plane, Rycroft creates a sense of a genuine happening, driven by giddy energy and unstoppable momentum. Readers will want to keep turning the pages and see who’s with the band next. 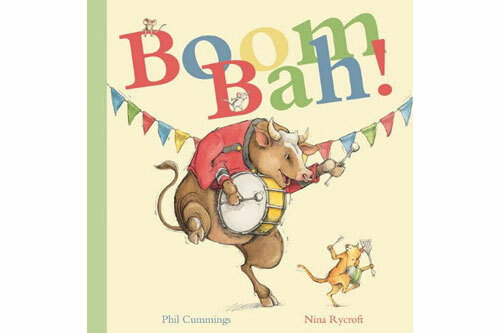 Author: Phil Cummings (EDC/Kane Miller, 2010, HC, 32 pp) Ages 2–5.